I just took a stroll to my mailbox. It is about a block away in a cluster with many others. Warm today, with a breeze out of the North and West. It’s March 11th, nearly the first day of spring, short just days. 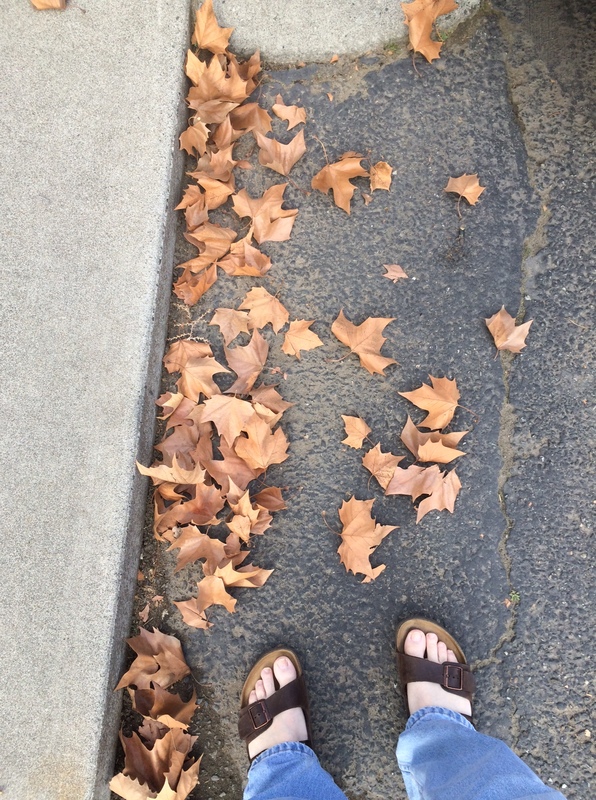 But in the air, the brown leaves fly, as well on the streets and sidewalks. I would guess that about 25% of the autumn leaves are yet to fall and be dealt with. Gathered, bagged, and made as fill down the road. Winter came late last year, and mostly all at once. It was 65 degrees one day, and plunged a night later to about 5 degrees. 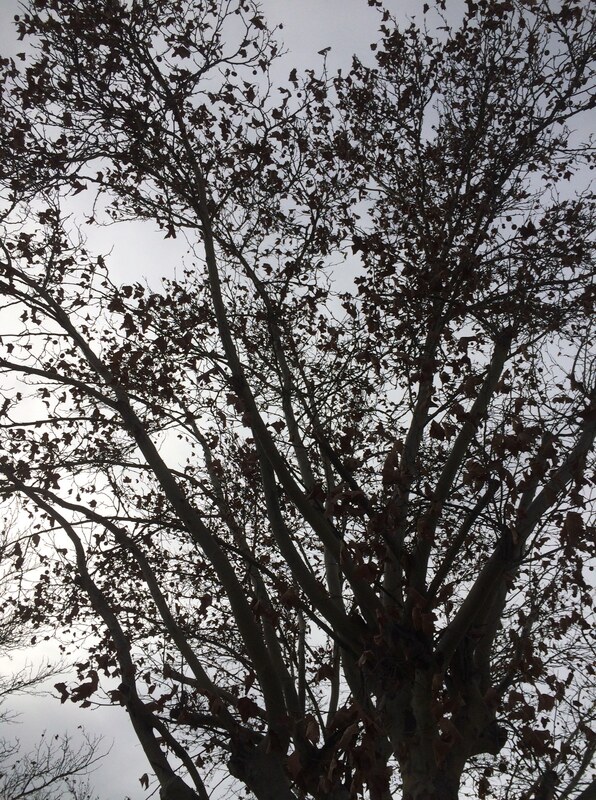 The leaves were yet green, the sap lost in limbo somewhere between the branches and the roots. And so the leaves held fast, held tight, and the green remained as if in struggle and defiance of the calendar and tradition. 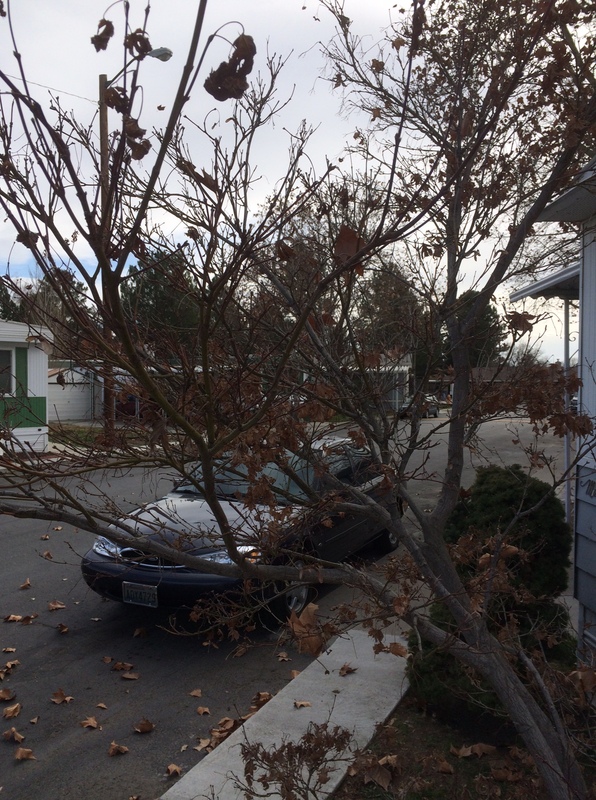 In the months passed well after my sycamores and ornamental red maple have normally given up their leaves, months that have been filled with generous and furious windstorms from many directions, still they dangle and taunt. Today whilst I wandered in my sandals and bare toes, with insects on the wing and ground, lady autumn lingers along with her sister, Spring. An odd dance is in the air. And at my feet and on the windshield of my late Momma’s Cadillac there under the trees, lay and pass by. Autumn leaves. True to me the sound so strange this time of year of year, sliding leaves on the warm ground; reserved for November and a while longer, but surely not March. I wondered where the new buds and leaves would find to appear and open whilst the business of last year still straggled. And so I wander in the midst of an unfinished season, perhaps two. And I wonder if there’s something I missed, something left undone and lingered. Whilst I prepared for spring and unfurled my watering and washing hoses this week, I walked upon decaying leaves, on last year’s loitered declaration that the cycle had turned and came to pass…but not really. I think we all have those things in life we store away, put off and save for that rainy day, for that moment when a parcel of “round tuits” arrive and then tasks are finally done. When that some-day comes around. I guess last year, when fall was supposed to be…be descending upon me here, it was cast into the warm Chinook winds that came instead. And today, nine days short of her official arrival, lady Spring patiently waits on the breeze, whilst the unfinished seasons takes her time to remove the leaves held fast to last summer’s trees. And there will be green leaves amongst the brown, both aloft and on the ground…during the strayed end to this unfinished season.